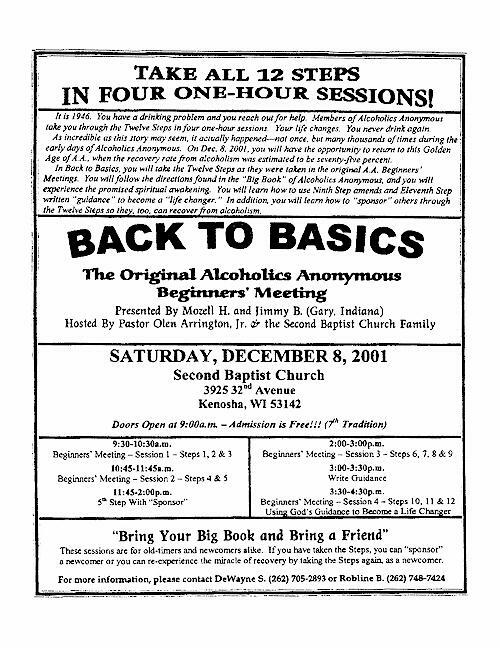 The Back to Basics Alcoholics Anonymous Beginners' Meetings were first taped during November - December, 1995 in San Manual, AZ. On four successive Friday nights, the entire Copper Valley Group took the Twelve Steps as part of their regularly scheduled A.A. meeting. 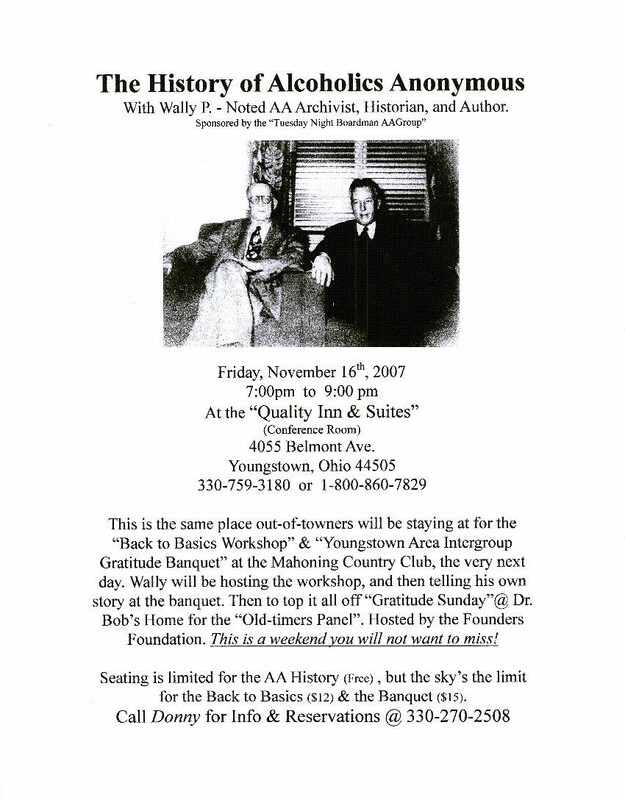 Tapes of this first Back to Basics program are still available from B Serene Audio (843) 245-0183. 2016 Holiday Greeting from Wally P. 2015 Holiday Greeting from Wally P.
2014 Holiday Greeting from Wally P. 2013 Holiday Greeting from Wally P.
2012 Holiday Greeting from Wally P. 2011 Holiday Greeting from Wally P.
If Back to Basics has saved your life, we ask that you now consider saving Back to Basics' life. As has been the case for the past 20 years, we continue to operate at a deficit. 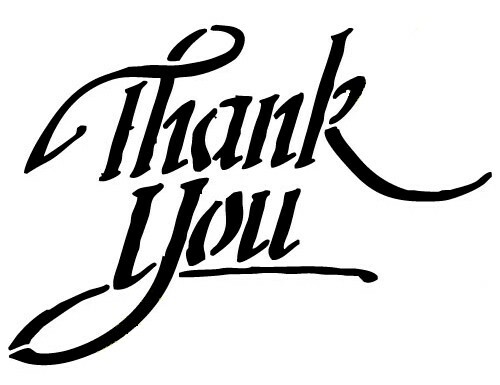 Please consider helping us out, so we can expand our outreach to additional prisons, half-way houses, and recovery centers throughout the United States, Canada and around the world. research from 1990 to 2017. Seating is limited. 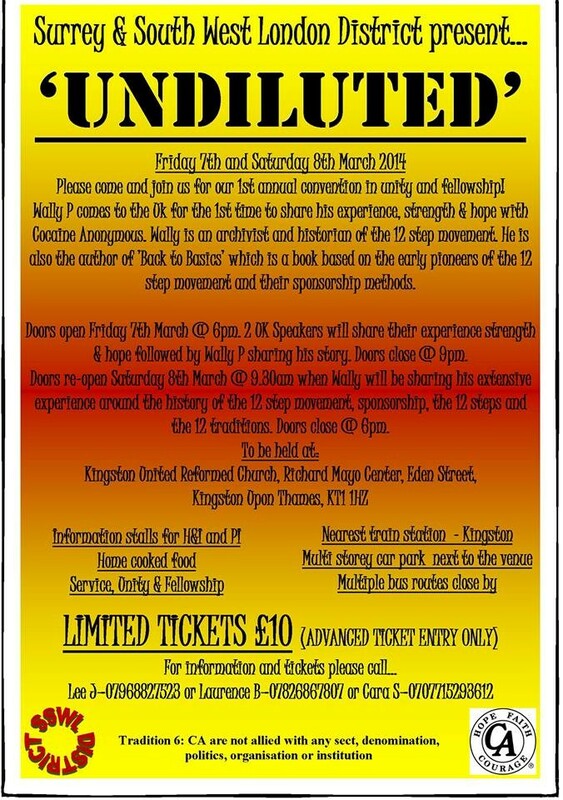 Get your tickets online! hfenton-chaffee@sunspirehealth.com What Step Are You On? 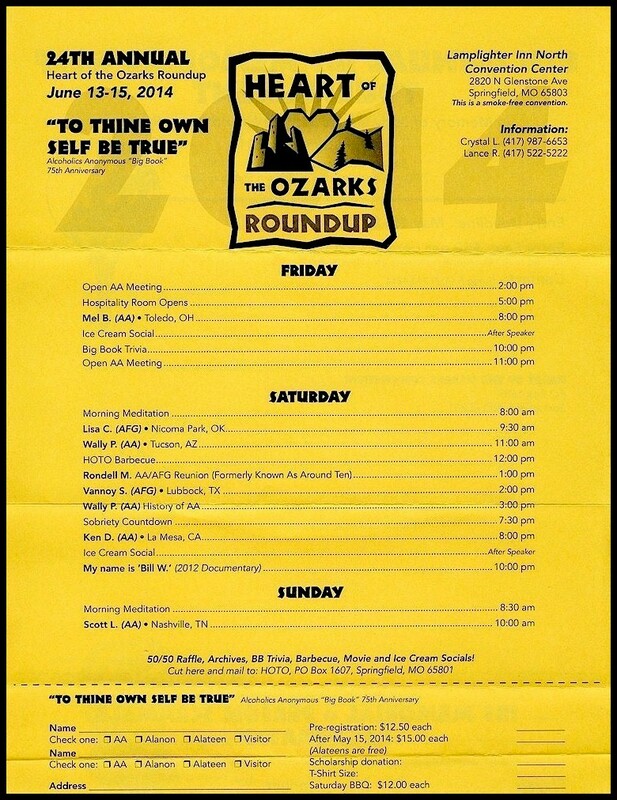 7500 E. Country Club Dr.
"James H., One of America's Greatest Life-changers"
This is a seminar for "anyone or everyone interested in a spiritual way of life." 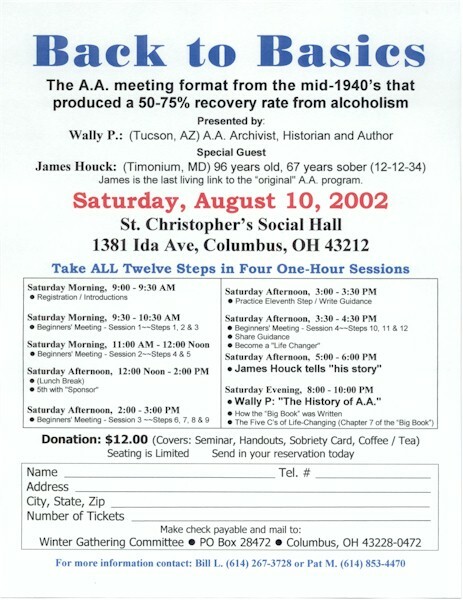 PowerPoint Presentation: "The History and Evolution of the Eleventh Step" plus a reenactment of "Dr. Bob and Anne Smith's 1935 Guidance Meetings"
A Tribute to James H.
Wally P. and Carver B.
Lansing, Mi "Meet the Author"
The Four Founding Moments of A.A.
Our Lady of Mt Carmel Catholic Ch. 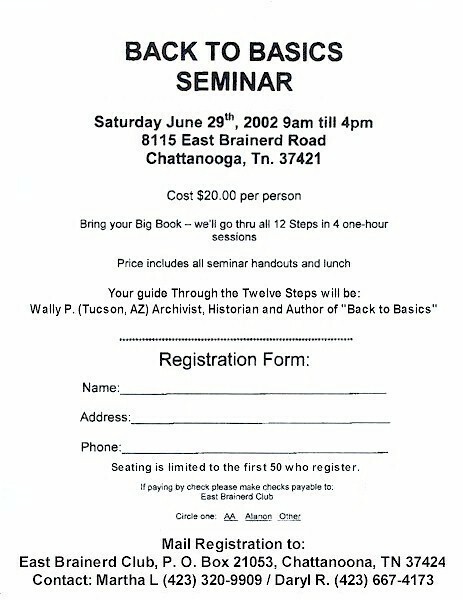 Anacortes, WA 98221 Wally P.
Verde Valley "Big Book Experience"
700 N Bill Gray Rd. Camp Verde, AZ Brian T.
Fellowship Hall - Palm Desert June T.
Subiaco, AR 72865 Wally P.
Wally P. Tells His Story About "Divine Appointments." 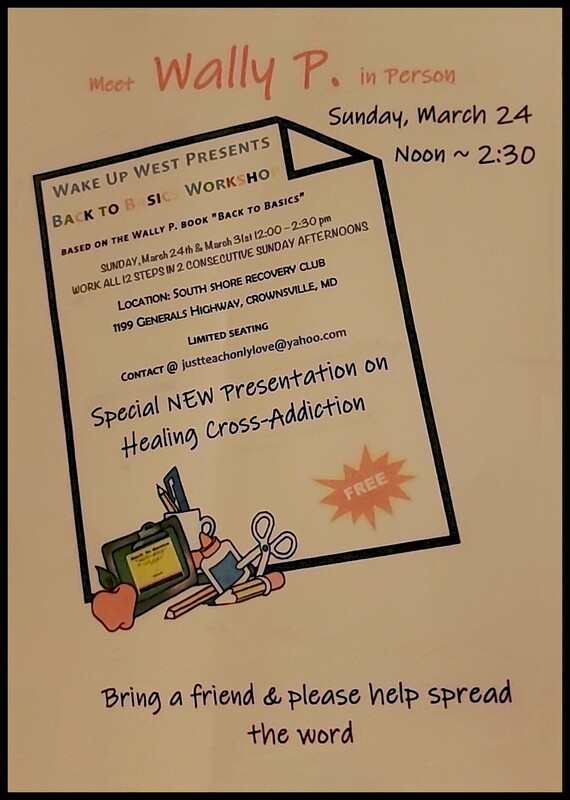 Boardman, OH 44512 Wally P.
Alliance, OH 44601 Wally P.
Timmonium, MD 21093 Wally P.
Student activities room Brian T.
Towson, MD 21286 Wally P.
Bowie, MD 20715 Wally P.
Jessup, MD 20794 Wally P.
Baltimore, MD 21215 Wally P.
Los Angeles, CA 90045 Wally P.
Big Book Workshop Brian T.
Windsor, ON, CANADA Wally P.
Coldwater, Mi 49036 Wally P.
Ft. Myers, FL 33912 Wally P.
Baldwin, NY 11510 Jimmy D.
Pittsburgh, PA 15219 Wally P.
Oshawa ON, CANADA Wally P.
Toronto, Ontario, CANADA M5B-2G3 Wally P.
Verona, WI 53593 Wally P.
Winona Lake, IN 46590 Wally P.
Mount St. Francis Retreat Center. 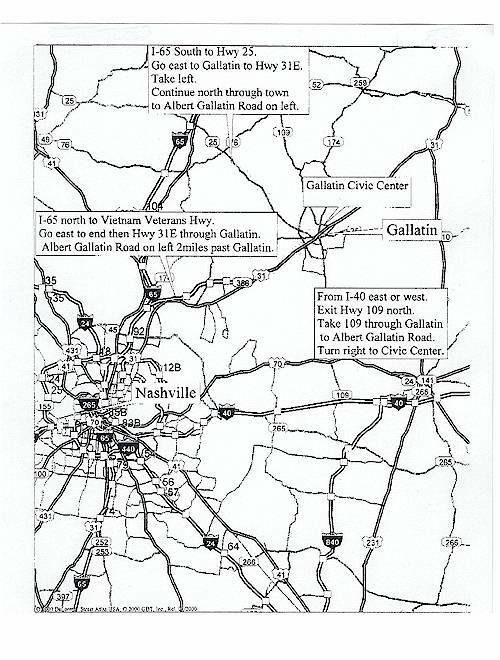 Dunedin, Florida 34698 Carol M. & George M.
Austin, TX 78751 Wally P.
Hattiesburg, MS 39402 Wally P.
East Dorset, VT Wally P.
Fort Meyers, FL Wally P.
Richardson, TX 75080 Wally P.
St Louis, MO 63141 Wally P.
Port Orchard, WA 98366 Wally P.
Gig Harbor, WA 98334 Wally P.
Sponsored by: Shoreline SAA Monday Meeting Dan B. 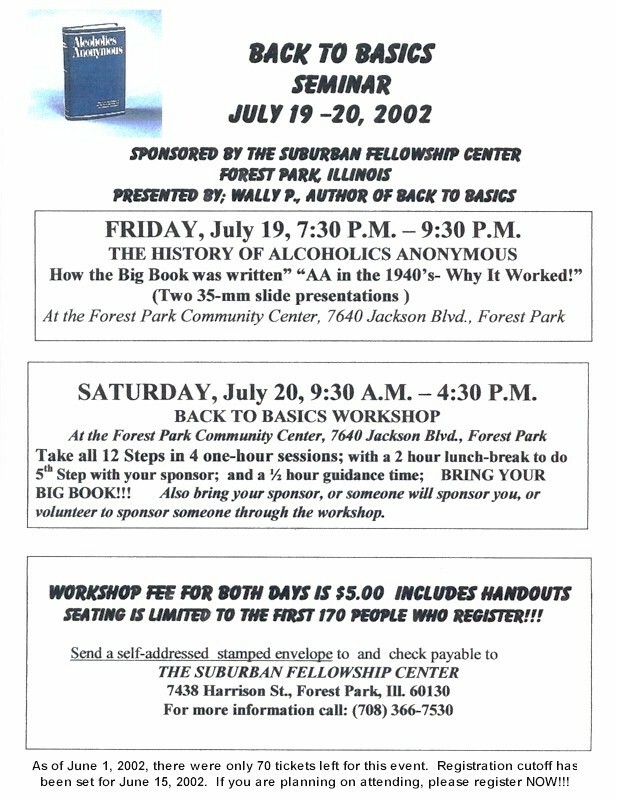 Back to Basics Spiritual Retreat Wally P.
Back to Basics One Day AA Seminar Wally P.
"Hoss" S (574) 268-8688 Wally P.
Contact: Shirley Z (906) 273-0512 Wally P.
Al G. (920) 621-3522 Wally P.
Elizabeth S. (601) 573-2299 Wally P.
Scotty (608) 216-6735 or Tom (608) 836-7536 Wally P.
Hosted by District 46 of A.A.
Alexandria, VA 22302 Wally P.
Center City, MN 55012 Wally P.
Rancho Mirage, CA 92270 Wally P.
Leesburg, FL 34748 Wally P.
Scottsdale, AZ 85260 Wally P.
Marina Del Rey, CA 90292 Wally P.
Toronto, M2N 1K4 Wally P.
Toronto, Ontario, CANADA M4K 1A1 Wally P.
Niagara Falls, Ontario, CANADA L2G 5S3 Wally P.
Cape Coral, FL 33904 Wally P.
Atlanta, GA 30305 Wally P.
Derry, NH 03038 Wally P.
Manchester NH 03103 Wally P.
Fort Worth, TX 76107 Wally P.
Big Book Workshop "A design for living the 12 Steps"
Please enter at the lower level. 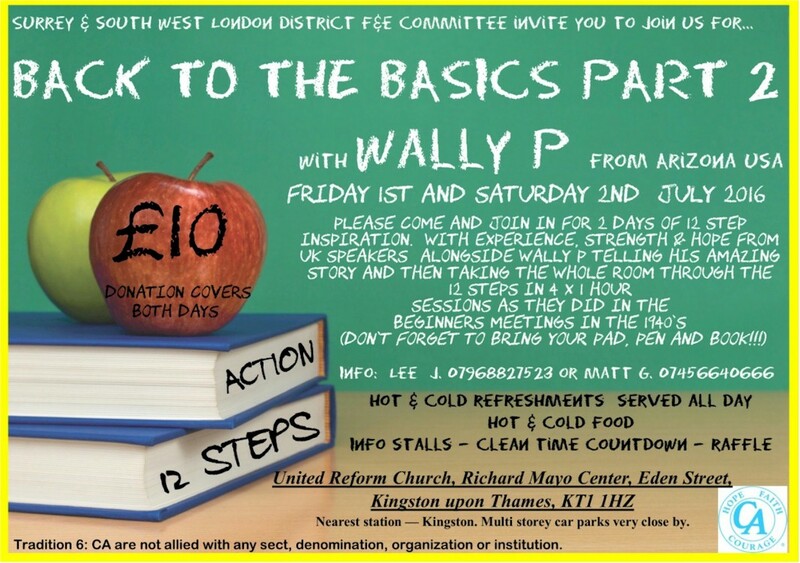 "A design for living the 12 Steps"
Austin, TX 78731 Wally P.
Session # 4 Steps 11 & 12 "Guidance"
Session # 3 Steps 6-10 "Restitution"
Session # 2 Steps 4 & 5 "Sharing"
Session # 1 Steps 1-3 "Surrender"
The 12 Steps and Spiritual Growth and Two Way Prayer. 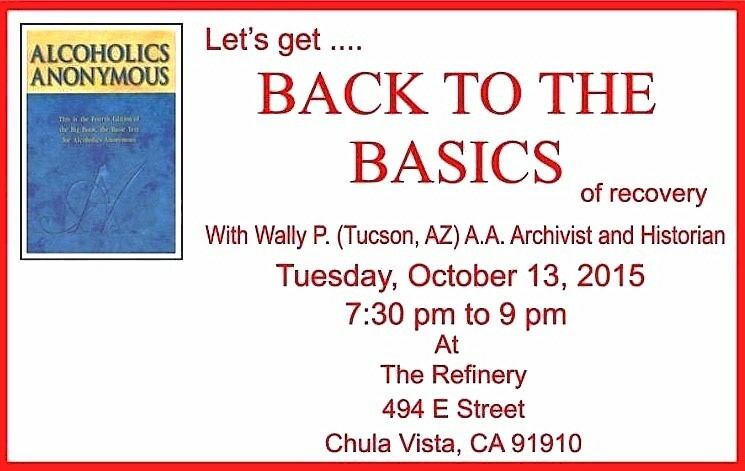 4090 E. Clear Creek Dr.
Ft. Defiance, AZ 86504 Katherine G. & Brian T.
Back to Basics Session # 4 "Guidance"
Camp Verde, AZ 86322 Brian T.
Back to Basics Session # 2 - "Restitution"
Katherine G. & Brian T.
Back to Basics Session # 2 - "Sharing"
of having a step working meeting. 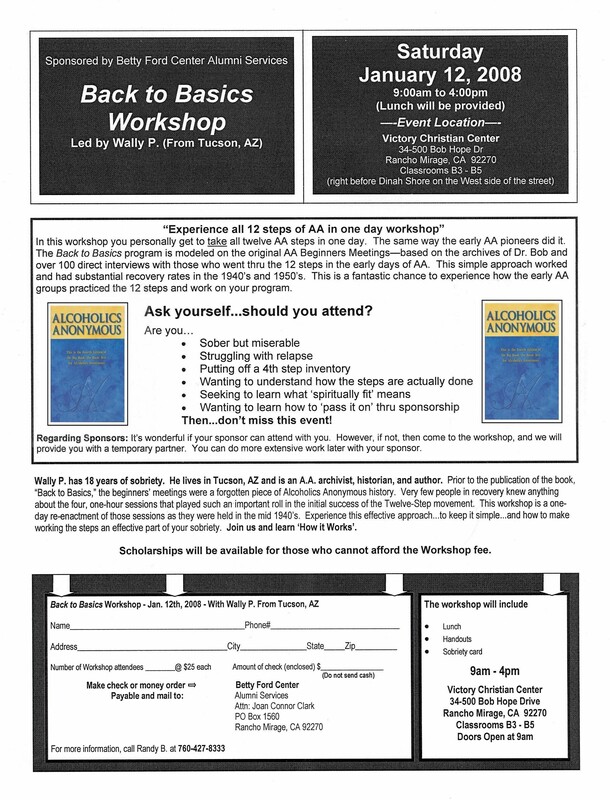 Hobbs, NM Katherine G. & Brian T.
Back to Basics Session # 1 - "Surrender"
Tucson AZ 85719 Debra A., Katherine G. & Brian T.
Women In New Recovery (WINR) "Women only"
Mesa, AZ 85201 Debra A., Katherine G. & Brian T.
Prescott, AZ 85301 Katherine & Brian T.
Flagstaff, AZ 86004 Katherine & Brian T.
Back to Basics 101, Two way prayer & Spiritual growth. 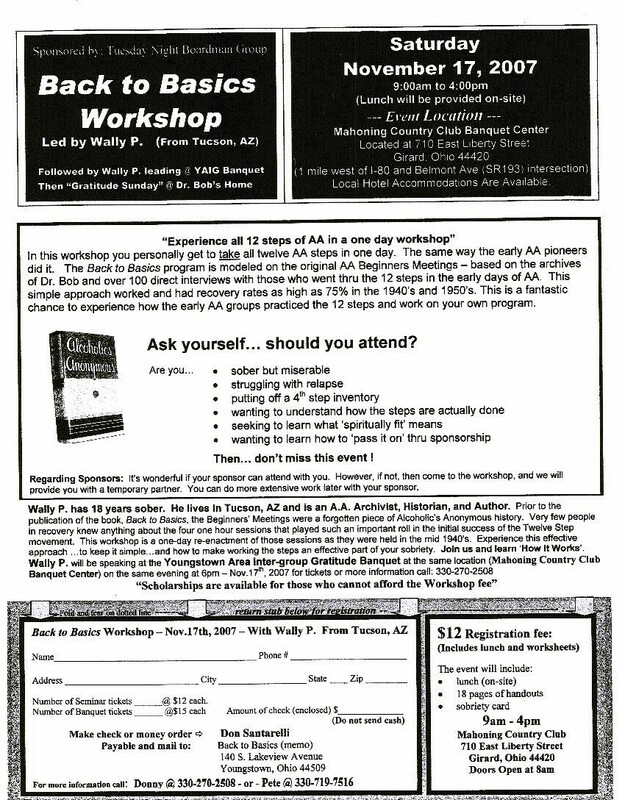 Sessions 3 & 4 Katherine G. & Brian T.
Back to Basics "Big Book" Workshop Sessions 1 & 2 Katherine G. & Brian T.
Session #1 Steps 1-3 Brian T.
Spirituality and the 12 Steps Brian T.
History of AA and B2B 101 Brian T.
Session #4 Steps 10-11 Brian T.
Session #4 Steps 11-12 Katherine G.
Session #4 Steps 11-12 Brian T.
Session #3 Steps 6-10 Brian T.
Session #3 Steps 6-10 Katherine G.
Back to the Basics of Sponsorship Wally P.
Back to the Basics of the Big Book Wally P.
Session #2 Steps 4-5 Brian T.
Session #2 Steps 4-5 Katherine G.
Session #1 Steps 1-3 Katherine G.
Brooklyn, NY 11223-3627 Wally P.
May 19, 2007 Chattanooga, TN Wally P.
May 12, 2007 Omaha, NE Wally P.
Cipete, Jakarta Indonesia Russ B. 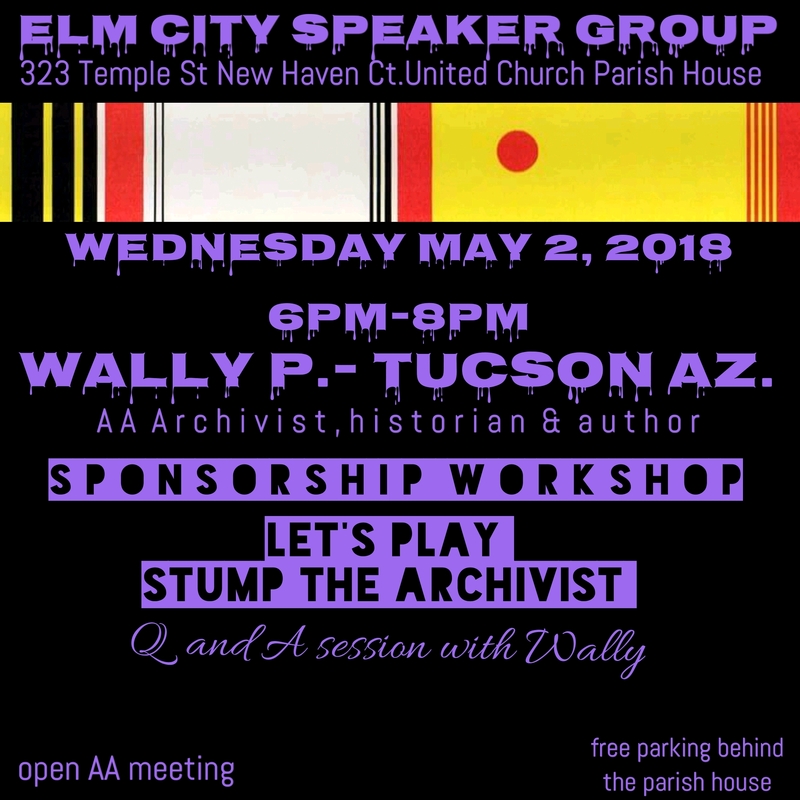 Camp Verde, AZ Wally P.
Mar 30-Apr 1, 2007 Hong Kong, China Wally P.
March 24, 2007 Far East Wally P.
Irvine, CA 90603 Wally P.
the Betty Ford Center--LA Chapter Wally P.
Villa Park IL 60181-2654 Howard B.
Flagstaff, AZ Katherine G. and Brian T.
AA district 5 Katherine G. and Brian T.
AA District 14-141 Katherine G. and Brian T.
Katherine G. and Brian T.
Ft. Collins, CO--80624-3705 Wally P.
Hong Kong Wally P. and Dr. Wayne M.
Beijing, China Wally P. and Dr. Wayne M.
Bali, Indonesia Wally P. and Dr. Wayne M.
October 17, 2006 Wally P. and Dr. Wayne M.
Hobbs, NM 88240 Katherine G.
St. Louis, MO 63128 Katherine G.
Atlanta, GA 30084 Wally P.
Fox Lake, IL Katherine G. & Brian T.
Palatine, IL 60026 Brian T. and Katherine G.
Rockville, MD 20851 Wally P.
Baltimore, MD 21201-0167 Wally P.
McHenry, IL 60050 Brian T. and Katherine G.
Fox Lake, IL 60020 Brian T. and Katherine G.
Brian T. and Katherine G.
Libertyville, IL 60048 Brian T. and Katherine G.
Honey Creek, WI 53138 Brian T. and Katherine G.
Cleveland, OH 44119 Chuck S.
Flagstaff, AZ 86004 Wally P.
Denver, CO 80203 Wally P.
Harrisonville, MO 64701 Chuck L.
10016 Kennerly Rd. South County. Camp Verde, AZ Katherine G. & Brian T.
Fox Lake, IL Brian T.
Hosted by the R.A.M. 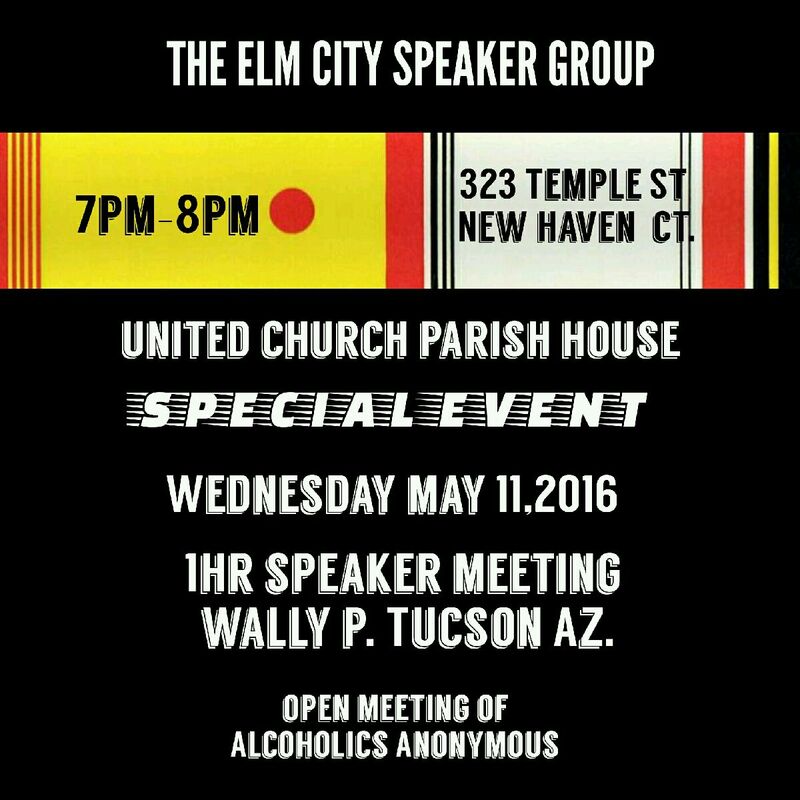 Group Wally P.
Hosted by "Happy Hour 5:30 Group Wally P.
2 way prayer and Celebrating 20 yr of sobriety. Katherine G.
Rahway, NJ 07065 Wally P.
22nd Session # 4 Katherine G. & Brian T.
Waverly, MN 55390 Wally P.
Leamington, Ontario, Canada N8H-1H1 Wally P.
Main St. Spring Grove, IL Brian T.
Ontario Inst. for Studies in Ed. Toronto, Ontario, Canada Chris R.
Salinas, CA 93901 Wally P.
Summerville, SC 29483-3344 Wally P.
Central Florida Intergroup Office Wally P.
Phoenix, AZ 85016 Wally P.
Akron, OH 44312 Wally P.
Hosted by The Mesa House Wally P. and Brenda C.
English Speaking Adolescent Treatment Ctr. Bahia de Kino, Mexico Wally P.
Hosted by AA of Greater Detroit Wally P. & James H.
Orlando, FL Wally P. & James H.
109 North Shore Drive Waverly, MN 55390 Wally P.
Bahia de Kino, Mexico Wally P. and Emily A.
Emily A. and James H.
Phoenix, AZ 85051-7422 Wally P. and Emily A.
Emily A., and James H.
Las Vegas, NV Wally P.
Hosted by The Mesa House Emily A. Going through all 12 steps in 5 weeks. Round Lake, IL Brian T.
Lansing Central AA Wally P. and Emily A. Spring Hill, FL 34601 Martha L.
Emily A and James H.
Washington, DC Ellie van V.
Columbus, OH 43212 Wally P. and James H.
Forest Park, IL 60130 Wally P.
Huron Valley Intergroup Office Wally P.
East Dorset, VT 05253 Wally P. and Mike H.
East Dorset, VT 05253 Wally P.
Austin, TX 78702 Wally P.
Austin, TX 7870 Wally P.
4214 Capital of Texas, Hwy N.
Salt Lake City, UT Wally P.
Poe G. and James H.
Wally P. and Poe G.
Poe G. with James H.
4214 Capital of Texas Hwy N.
Wally P. and James H.
with Steve G. and Dave L.
Back to Basics Spiritual Revival with James H.
James H. with John and Susan H.
Wally P., Steve G. and Jimmy B.
Wally P. and Steve G.
Wally P., Mozell H. and Jimmy B.
Wally P. and Corey F.
Steve G. and Corey F.
Mark H and Floyd H.
Wally P. and Steve G., with James H.
Wally P. and Mike T., with James H.